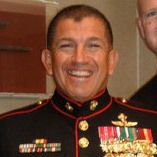 Charles “Chunks” Padilla served in the United States Marine Corps for 29 years until he retired as a MGySgt in 2011. In his 29 of service Charles Padilla has served in 2 infantry battalions, 2nd Bn 1st Marines and 3rd Bn 9th Marines, 3 Reconnaissance commands 1st Reconnaissance Battalion, 5th Force Reconnaissance Company and The Basic Reconnaissance Course and 2 MARSOC Commands, MARSOC SPECIAL MISSIONS TRAINING BRANCH and MCSOCOM DETACHMENT ONE. “MCSOCOM DET ONE” was the first experimental unit utilized in the “Proof of Concept” for the Marine Corps commitment to the United States Special Operations Command. Due to the success of MCSOCOM DET 1 this “Proof of Concept” began the birth of what we know today as Marine Special Operations Command (MARSOC). He also served at the Mountain Warfare Training Center as a Mountain Leader and did a tour with the British Royal Marine Commandos, as an instructor at their Mountain Leader Course. Charles Padilla has dedicated his 2nd career to helping our Wounded Warriors. In 2010, Charles joined “The Gumpathon” charity run where he and 3 British Royal Marines ran from New York to Los Angeles in 64 days, each Marine running an average of 22 miles a day in support of the Semper Fi Foundation and in 2012, Charles joined the Tour De Forces Team where he ran 30 Marathons in 36 days in support of our “Wounded Warriors”. He will now run for The Recon Foundation to help raise money and awareness for our “RECON BROTHERS” who have given their all.